You know when you read a book, you usually end up playing out the scene in your head — what do the characters look like? And that’s not just general descriptions. Can you actually picture their face? If so: ARE YOU A MAGICIAN? How do you work this wondrous piece of imagination? I never picture real people. I hate facecasting. I’m pretty much never satisfied with an actor — I mean, there are good ones, but they’re never perfect. Instead of describing from a photograph when I write, I’ll piece together descriptions from people I know until I find what I want. I like to get the feeling of a character being there. Like, Levi from Fangirl — he’s just a sort of perpetually hazy and sunny presence in my imagination. For some reason, even though I hate to picture people, I can work with illustrations way more easily. Where I can’t find a perfect facecast, I often can find my ideal fanart. And when I play out scenes from a novel, it will always have the vague idea of a place I’ve been before. Example: I will always picture school halls as my junior hall. ALWAYS. I have no idea why. And for any book set in US high school, my brain will probably pick a room from a bad high school movie/possibly a Disney channel show and uses that. Because obviously those are accurate representations of school. I DON’T EVEN KNOW. Sometimes my brain just conjures up random buildings and rooms to feed my reading habits and I don’t even know where they come from. Everything just sort of blurs together. Buuut I think that sometimes the movies/art become meshed with the books in my mind. I’m kind of upset the Harry Potter movies got to me before I read the books, and I’m upset for kids reading them now — because I defaulted to a weird blurred face of Daniel Radcliffe. I’d rather be able to headcanon characters myself! Even if, like, I don’t headcanon them whilst reading, because I am a Strange Person with invisible people walking around in her head as she stares at pieces of trees. When a series become so intermeshed with the image of someone (or when they have a ton of faces on the covers, yeugh) the image becomes intermeshed with the character. *nods* If I enjoy a romance in the book, I’ll probably be less into it when I watch the movie. My brain doesn’t like seeing people in images that it has already seen in words. 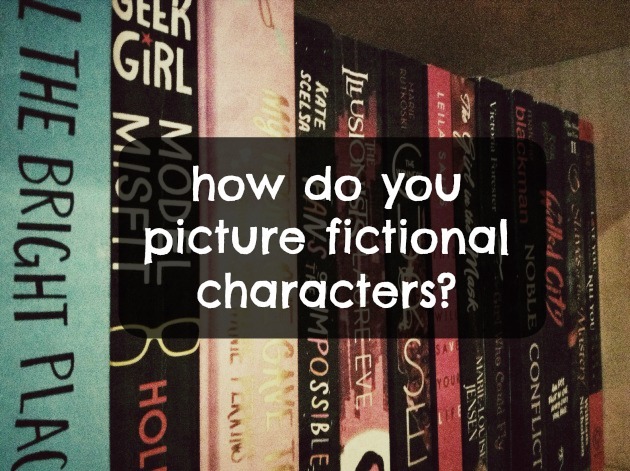 How do you picture fictional characters? Do you have a dream cast for your favourite book? Writers, what do you think of describing from images?